Get your pupils into shape with an ice-breaker activity. Assess basic vocabulary with speaking and a bit of writing. Back to school time when you try to get to know your students and want them to like coming to your English class. You wonder what they are like? What's their level of English? What vocabulary they can work with? It might seem boring to ask students one by one about their names, hobbies or favourite colours. Make it more exciting to sit them down in a circle, put some music on and pass around a ball. Whenever the music stops the ball stops, too. Whoever gets the ball can say a sentence about themselves. You can put different categories on the board such as Favourites: Animals, Fruit, Colours, Hobbies... etc. So when a child tells one thing about himself you can write that on the board under the corresponding column. It will help students to spell the words correctly later on when they have individual practice. Get every pupil to have at least one go. When you finished with this part, make children compare their hands with each other. Everybody has fingers, thumbs, palms, ... etc. Everybody's hands are the same in one way but their size and nails look different. This is the same with the things we like, too. Now you can explain the exercise they are going to do. Then children get a piece of paper and pencil to trace around their hands. 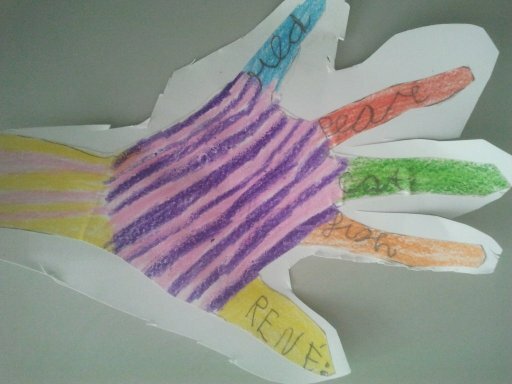 They have to write about different thing they like into every finger and decorate their hands the way they like it so later on they can go on the walls as an ESL classroom decoration. Kids like making nice patterns so you can be sure they will enjoy this activity.